Okay, I know this is a million years late, but I am finally getting around to uploading pictures and attempting to catch up on all my backlog of blog posts! 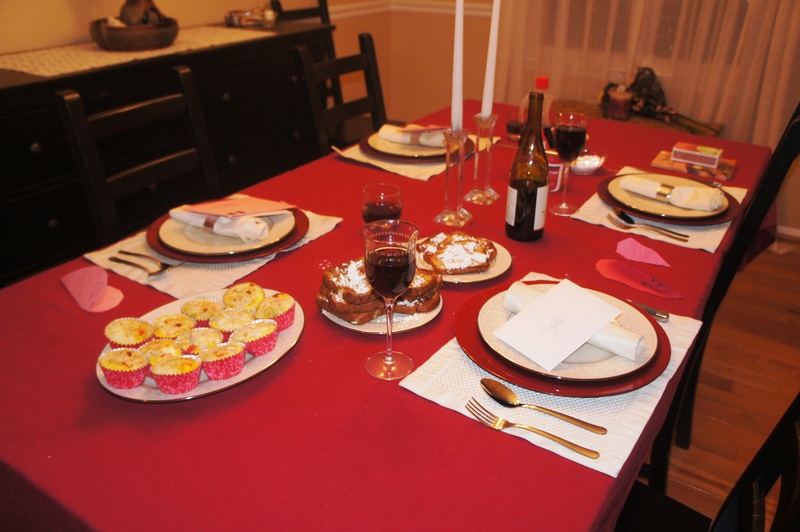 Here are pictures from our Valentine’s Day unit! Some of the activities I found were heavily Cupid-themed. Since the girls don’t know who he is, I decided not to introduce this mythological character right now. I also avoided a lot of the activities and events that I felt promoted the give me-itis. 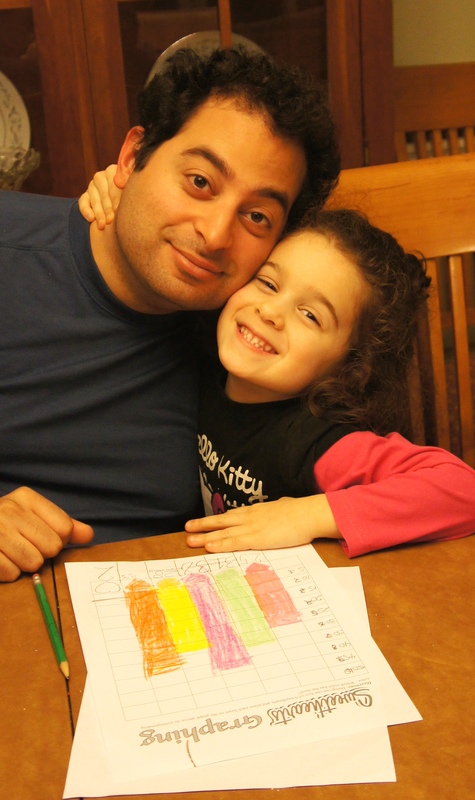 And I tried to downplay the candy focus of Valentine’s Day, though that didn’t last very long with my girls. 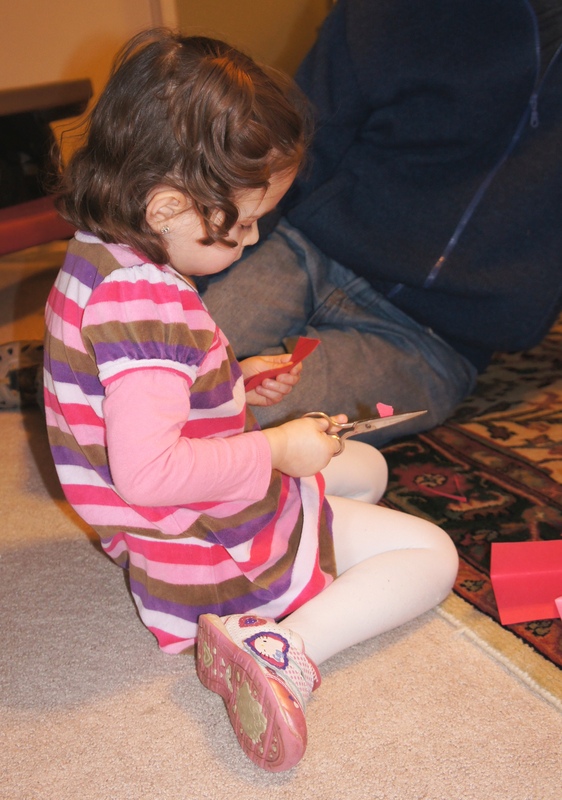 Daddy also didn’t help in that regard, since he decided the girls needed little heart boxes of chocolate! 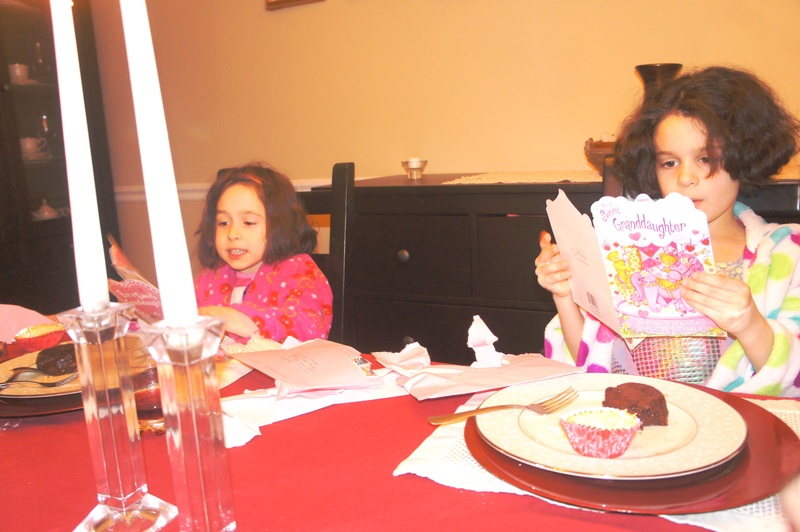 We created our first file folder books with Valentine’s Day, and that was as much of an experiment for me, as for the girls. I’ve found that I still don’t feel comfortable winging it too much, and prefer the security blanket of detailed, precise, teacher instructions! Oh well, maybe later on. 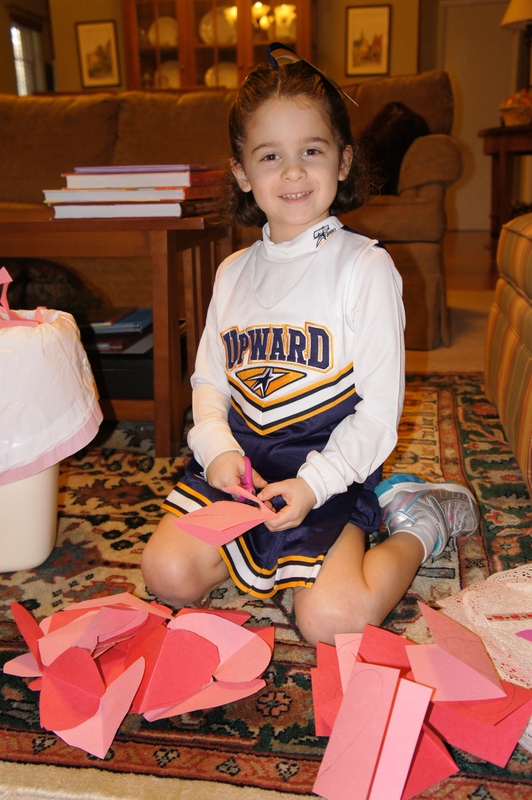 First, we practiced our cutting skills by teaching the girls how to make hearts by folding the paper in half. 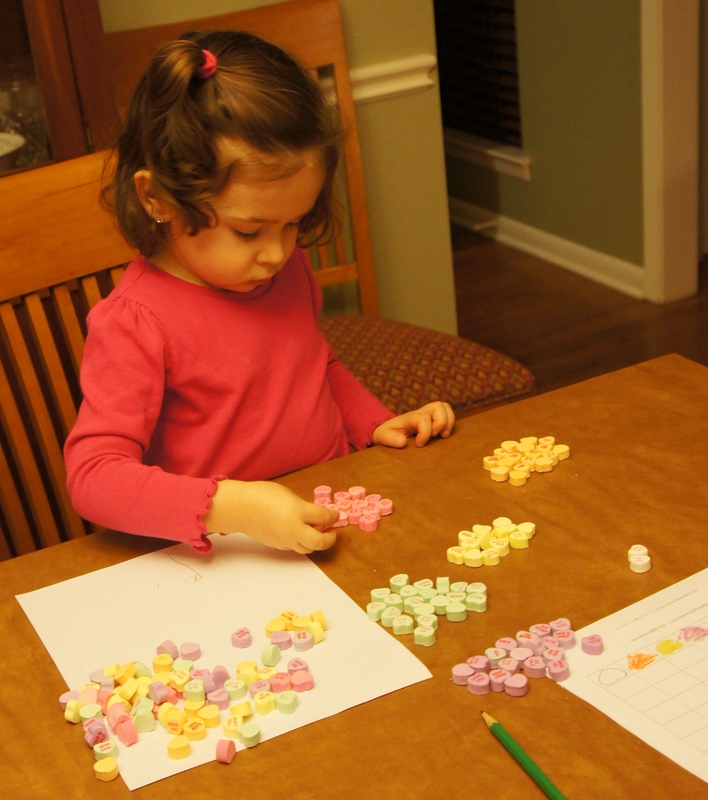 Then, using a full back of the candy hearts, I had Lily sort them by color. 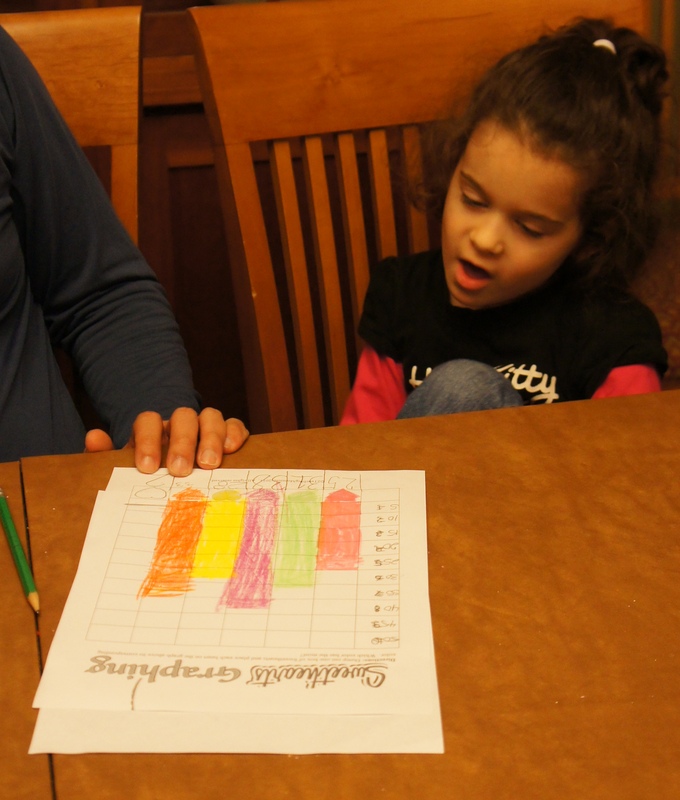 Abby’s job was to count the sorted piles and create a graph so we could figure out which color had the most. What I sadly don’t have pictures of was my favorite activity! (I forgot.) I went to dollar store and found packets of those lace doilies like we used to use to make valentines in school. The girls decorated them with coloring and stickers, and we took them up to a local assisted living facility. This was the same facility that my grandmother stayed in for many years, and so when I told them who I was and my girls had some Valentines to pass out, the director was thrilled to show me the activity room and interrupt the weekly bingo game. Many of the ladies there remembered my grandmother and were completely charmed by the girls and their homemade valentines. And I must say how sweet and loving the girls were to these ladies they didn’t even know. They walked right up to each of them, handed them a decorated heart and told them Happy Valentine’s Day, even my shy three-year-old! I don’t know why their sweet spirits surprise me, but I am so thankful for them! My hope is that we can continue this tradition in the future, to reinforce the concept of showing and sharing our love to others, instead of our society’s “What’s in it for me” disease.